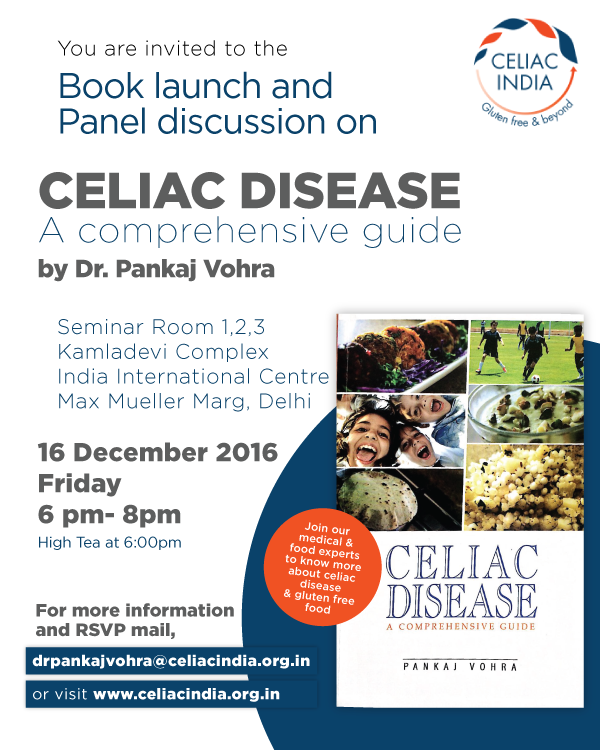 Welcome to Celiac India & Beyond Foundation! In my 15 years of pediatric gastroenterology practice, I have encountered many diseases but nothing as unique as celiac disease; especially it’s treatment – sounds easy but is not straightforward and is actually challenging most of the times. In fact, celiac disease is unique in many ways. Unlike many other chronic conditions where the epidemiology (incidence and distribution), diagnosis and the treatments are changing, celiac disease is unique in a way that the disease itself is changing! For example, in Western countries, the extra-intestinal manifestations (disease symptoms and signs that lie outside the gastrointestinal tract) are seen more commonly whereas in India, from a completely intestinal form of the disease about 10 years ago, we are now seeing almost one third of the children presenting with extra-intestinal manifestations. Besides, more and more adults are being diagnosed with celiac disease – something that was not considered when the epidemic of celiac disease started in India. Another important phenomenon is that celiac disease is now being diagnosed in obese children and obese adults as well – something unheard off till recently. As a matter of fact, new information about celiac disease is continuously pouring in. For example, did you know that the rates of celiac disease are suspected to be higher in children born through caesarean section? Or that by initiating wheat between 6 and 7 months of age under the cover of breast feeding may actually decrease (but not eliminate) the risk of celiac disease? Another unique aspect of celiac disease is its treatment primarily because it has not changed over the last half century and that a strict dietary modification can reverse symptoms in almost all cases. Can you imagine the delight on the face of a young man who has cirrhosis of the liver and is slowly slipping into end stage liver disease and then finds out that he has celiac disease and the liver disease stabilizes on starting a gluten free diet? Can you imagine the excitement for a young lady who learns that the cause of her infertility is celiac disease and that can be reversed by just a change in her diet? Or a 16 year old teenager who looks like an 11 year old and is taunted by her friends – the cause of delayed puberty being celiac disease and a gluten free diet maybe able to let her grow and push her into puberty? Hunting out this condition and making the diagnosis can become a battle as it presents in various ways but the real challenge of celiac disease begins once the diagnosis has been made. The thrust thus has to be the management of celiac disease which essentially means managing a strict lifelong gluten free diet. Easy, it may sound, but proves to be extremely difficult for the large majority of our cases in India due to lack of accurate information and in fact, lack of access to information. Ensuring wide and easy availability of resources – information and gluten free options – which will help celiacs manage gluten free diet through the rest of their lives, because as we understand it today, this is a life-long disease. Our efforts will be geared towards achieving the above and our website will be our key vehicle to help us achieve it. In fact, when we were getting this web site ready, we asked ourselves several times the question – Do we really need another web site for celiac disease? Aren’t there already enough web pages devoted to celiac disease? But each time the answer was a resounding ‘Yes’. We definitely needed a resource that catered to our local population right across the length and breadth of the nation. We envision ourselves and our website to be just that – comprehensive, customized and dynamic. Our logo too represents the same. I must also add that the number of patients with wheat allergy and other forms of gluten intolerance are increasing world over, including in India. Though they have not been represented separately on our website, they will benefit from all our efforts. In fact, we plan to interact with the food and hospitality industry to keep improving and increasing these ‘options’. Stay tuned – As Celiac disease keeps changing its color, we will keep updating you with knowledge and new initiatives!